Students Scott Persing, 18, and Courtney Draper, 17, take a step toward a veterinary career as they practice their skills on Dwight the shih-tzu at Technical College High. PHILADELPHIA – In one of the newest and fastest-growing secondary schools in Chester County, teacher Katie Smith was demonstrating proper technique to 16-year-old Courtney Draper and 18- year-old Scott Persing – with a big assist from Dwight. Dwight is a silken-haired shih tzu. 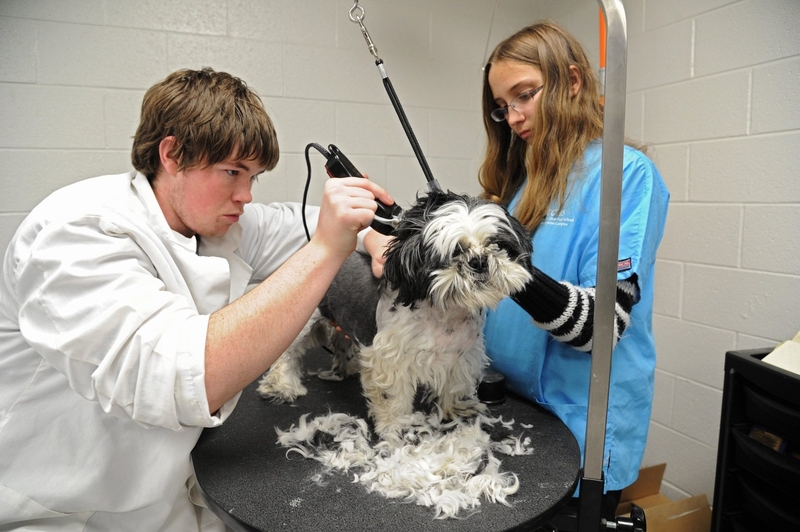 Persing was anxiously shaving fur from the squirmy toy-breed canine at the Brandywine campus of the Technical College High School, run by the Chester County Intermediate Unit, taking another step toward a veterinary career. Formerly branded “vo-tech” and disdained by baby boomers and their children who saw them as dumping grounds for college-track washouts, programs such as this – redubbed “career and technical education,” or CTE – can barely expand quickly enough to meet the demand from a new generation of students. They have watched costs skyrocket and job prospects dwindle for university graduates, even as well-paying skilled jobs in manufacturing, auto repair, and medical centers that don’t require college degrees go begging. Draper, Persing, and thousands of others are opting to learn something beyond biology, geometry and Shakespeare: a trade. “You’ve got to keep calm because they can sense it,” Persing said of dogs as he worked on Dwight. Persing is a senior from Downingtown East High School who, like many of the 750 students on the Brandywine campus, aspires to both a career and a college degree. In another corner of the 180,000-square-foot former warehouse, reinvented as a vocational high school two years ago, the gentle hum of dog shears gives way to the blast of a spray-painting machine at the auto-technician shop, where Reggie Stoltzfus, 18, of Coatesville, Pa., was painting a car fender. “I love it,” he said, removing his protective glasses. Increasingly, employers are approaching school districts with the goal of developing – and in some cases paying for – highly targeted programs to create qualified applicants for hard-to-fill jobs. In Chester County, the Sikorsky Global Helicopter unit in Coatesville has talked to the Intermediate Unit about launching an aviation-training program. Joe O’Brien is executive director of the Chester County IU, a provider of services to 12 school districts in its region. The Intermediate Unit has built two CTE campuses since 2008 at a cost of $63.5 million and which plans to replace a third facility with a new building in the next few years. O’Brien said enrollment has jumped 10 percent in recent years and should continue to rise as the county looks to devise new job-pipeline programs with top local employers such as Sikorsky. Such stories are fueling both a surge in career-training enrollment and a long-overdue overhaul of outdated vocational and tech programs – in the region and nationally. Most students spend two to three hours a day for up to three years in career training, although a few schools, such as Bucks County Technical High School, where enrollment is also growing, are self-contained and even offer adult-education classes. The sending district pays the IU $9,784 per student. In Philadelphia, which has struggled for decades to adjust to the loss of lower-skilled factory jobs, school district officials are working on an overhaul of career-oriented education that would roughly double the number of slots – currently pegged at about 6,000. The job market realities have motivated many students to reroute their educational roadmaps. Today, Way leaves the technical school at midday to work at an apprentice-style job at nearby B&G Manufacturing Co., where he helps make medical parts such as bone screws and vertebrae. “It’s really cool,” he said. Michael Lucas, administrative director of the North Montco school, said enrollment in September was expected to be about 15 percent higher than it was five years ago, when the school was in the midst of a renovation. One of the biggest hurdles is stigma – not among students, but parents, who still believe any diversion from the four-year college degree track is a mark of failure. “The image is the largest battle. Parents say, ‘I’m not sending my kids there. All the druggies go there,’” Lucas said. Instead, the reality is someone such as 18-year-old Jocelyn Imdurgia, a senior at Bishop Shanahan who attends Brandywine’s health career academy for nursing in partnership with Delaware County Community College. She expects to graduate with seven college credits and eventually get a four-year degree. “I always knew I wanted to be a nurse, and when I found out this school was being built, I was really excited,” said Imdurgia, who is learning to take vital signs and document patients’ conditions at the Veterans Affairs facility in Coatesville.